A composite image shows the galaxy NGC 4522 in the Virgo Cluster, the nearest large cluster of galaxies to our own local group of galaxies, and the “wake” of gas and dust being blown from the galaxy. The galaxy appears blue in the Hubble Space Telescope image in visible light. The superimposed red image is from Spitzer data and shows emissions from dust that traces molecular hydrogen. In the image, the galaxy is moving down and into the plane of the photo. A newly published study provides the first direct evidence that an intergalactic “wind” is stripping galaxies of star-forming gas as they fall into clusters of galaxies, helping explain why galaxies found in clusters are known to have relatively little gas and less star formation when compared to non-cluster or “field” galaxies. Toronto, Ontario – Astronomers from the University of Toronto and the University of Arizona have theorized that as a field galaxy falls into a cluster of galaxies, it encounters the cloud of hot gas at the center of the cluster. As the galaxy moves through this intra-cluster medium at thousands of kilometers per second, the cloud acts like a wind, blowing away the gas within the galaxy without disturbing its stars. The process is known as ram-pressure stripping. Previous observations showed indirect evidence of ram-pressure stripping of star-forming gas. Astronomers have observed young stars trailing from a galaxy; the stars would have formed from gas newly-stripped from the galaxy. 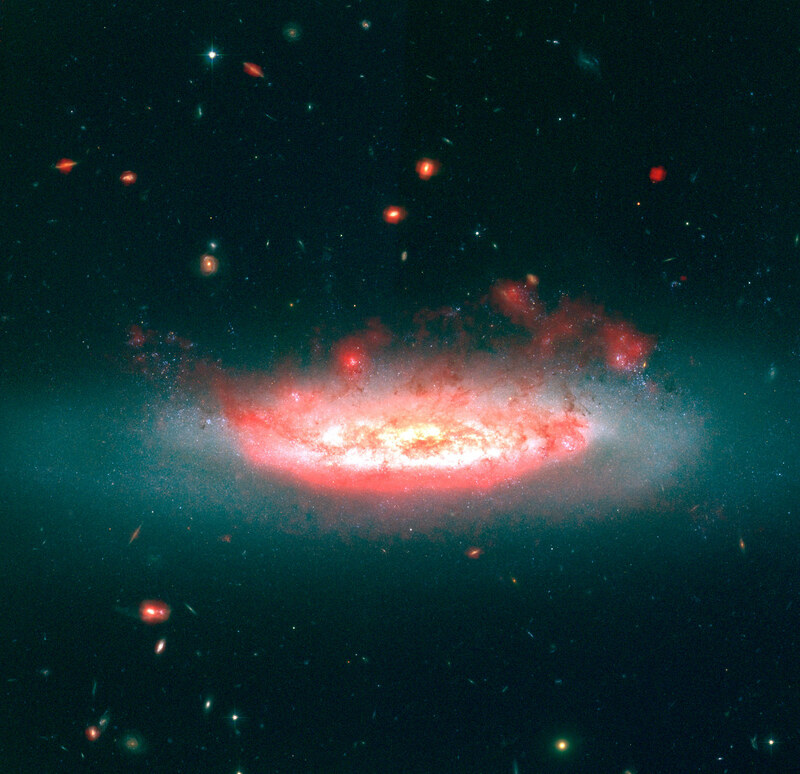 A few galaxies also have tails of very tenuous gas. But the latest observations show the stripped, molecular hydrogen itself, which can be seen as a wake trailing from the galaxy in the direction opposite to its motion. The results, published in the Astrophysical Journal on Nov. 10, are from observations of four galaxies. Sivanandam, Rieke and colleague Marcia Rieke (also from the University of Arizona) had already established that one of the four galaxies had been stripped of its star-forming gas by this wind. But by observing four galaxies, they have now shown that this effect is common. The team made their analysis using optical, infrared and hydrogen-emission data from the Spitzer and Hubble space telescopes, as well as archival ground-based data. The team used an infrared spectrograph on the Spitzer because direct observation of the molecular hydrogen required observations in the mid-infrared part of the spectrum—something that’s almost impossible to do from the ground. 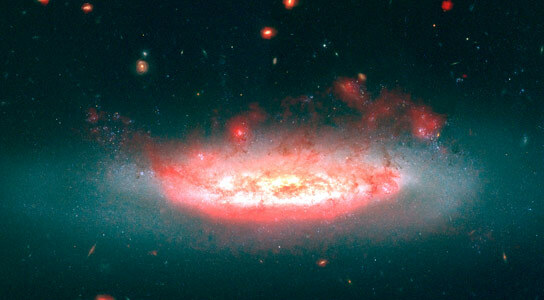 Be the first to comment on "First Direct Evidence That Intergalactic “Wind” is Stripping Galaxies of Star-Forming Gas"